Rand tube in a reflector made by Pipetalk. I have a GoSun Sport evacuated tube oven, a 5” Rand tube in a parabolic reflector stand, and a home-made Haines panel cooker. I am waiting for an All American Sun Oven and a SolSource Sport parabolic cooker to arrive. 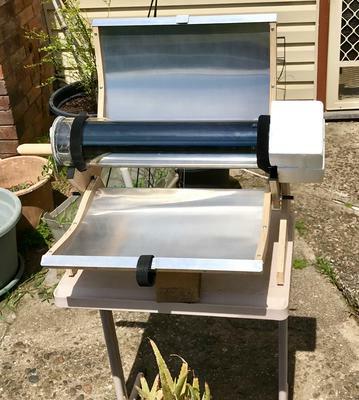 I use solar cooking because I live in a very sunny, sub-tropical climate zone, in Australia. Energy costs are high in Australia, and I wanted to have off grid options because my rural power supply can be uncertain. We often have a complete fire ban, so solar offers ways of cooking outdoors without fire. I am hoping that the combination of a parabolic cooker for fast, high temperatures, and a good, well-insulated box oven for roasting, baking, food dehydration and thermal cooking, will cover most of what I want or need to cook. The solar tubes are wonderful for fast cooking, and are great thermal cookers, too, but I hope to use my normal cookware and pans on the parabolic and in the box oven. And boiling or pasteurising water would be important in any emergency cooking after a storm, flood or bush fire. I like to know that I can make coffee, come what may, as long as the sun shines! Comments for Tubes or boxes?